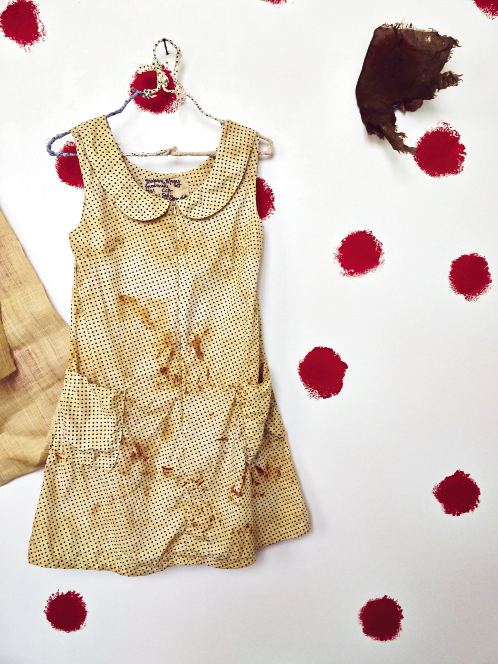 In addition to her hats, Leigh Magar is now meshing art and fashion with her Madame Magar line of frocks. 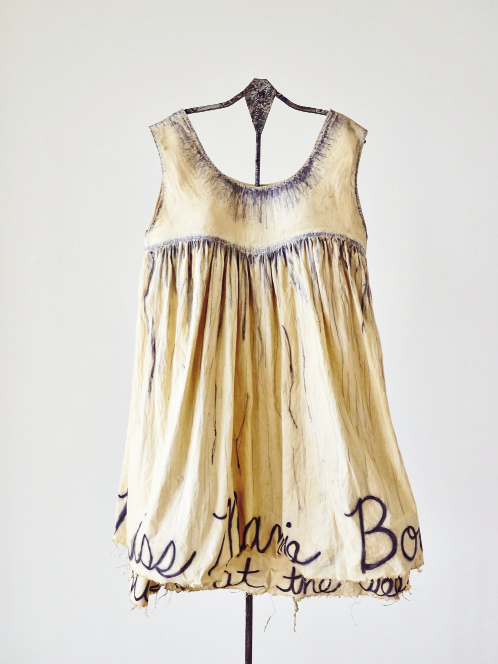 Her latest collection is on exhibit at the 701 Center for Contemporary Art in Columbia. 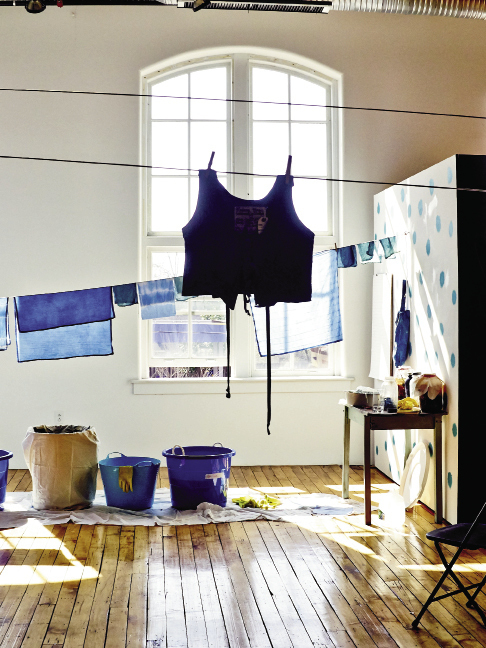 At the 701 Center for Contemporary Art, the new Madame Magar collection of muslin and canvas frocks hangs on pulleys and hooks. 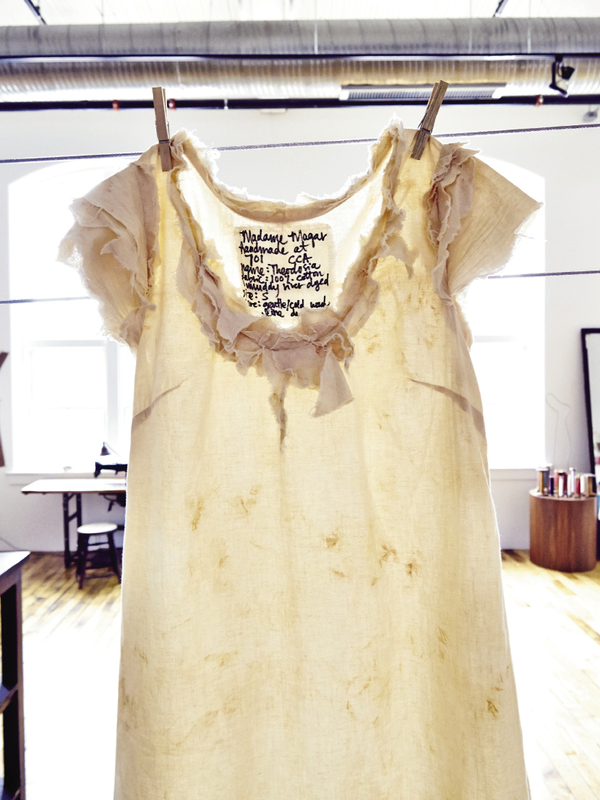 As part of the exhibit, Charleston-based designer Leigh Magar has created a temporary studio workshop within the gallery space so visitors can see her sewing, dyeing, and adding penciled lettering to the dresses. 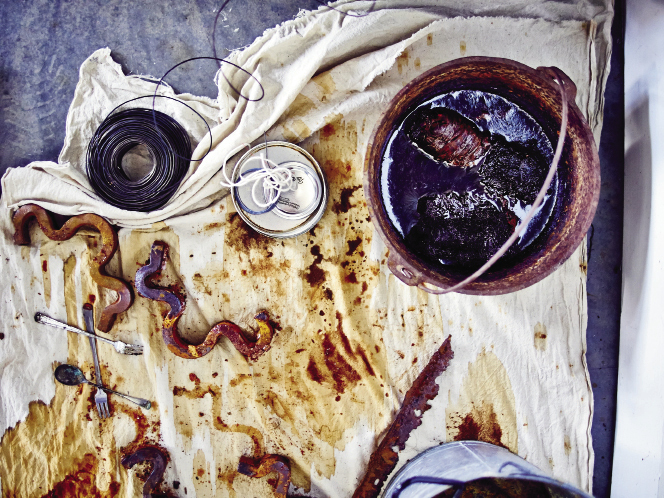 Visitors to the exhibit can see Magar’s process for creating the rust-dyed effect with broken railroad spikes and other bits of metal refuse found around the train tracks near the Columbia mill site. She painted dots by hand onto fabric and on a wall at the gallery. Some of the collection’s dresses are off-the-rack functional pieces in prints and solids (above), while others are more sculptural art creations: full-size frocks with rust or pencil-drawn markings over-dipped in starch to hold their form. 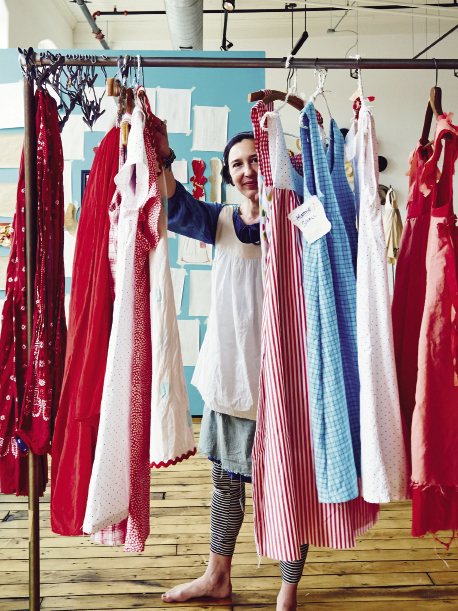 Wearing a white canvas dress with tomato-red dots, an indigo-dyed scarf knotted on her head, black-and-white striped leggings, and pointed red slippers with sequins sewn on top, LEIGH MAGAR is going about an ordinary day—for her. We’re sitting at a vintage ’50s enamel-topped kitchen table on the single house porch of her circa-1825 Cannon Street studio. Her cropped, dark hair is cut in a ’20s movie starlet’s blunt style, and she recalls a Mae West quote, “It’s better to be looked over than overlooked.” In the day’s last bit of sun, the conversation turns to the 1980s art and music scene of Athens, Georgia. If you know Magar, if you’ve ever seen her, you immediately realize her style blurs the decades. 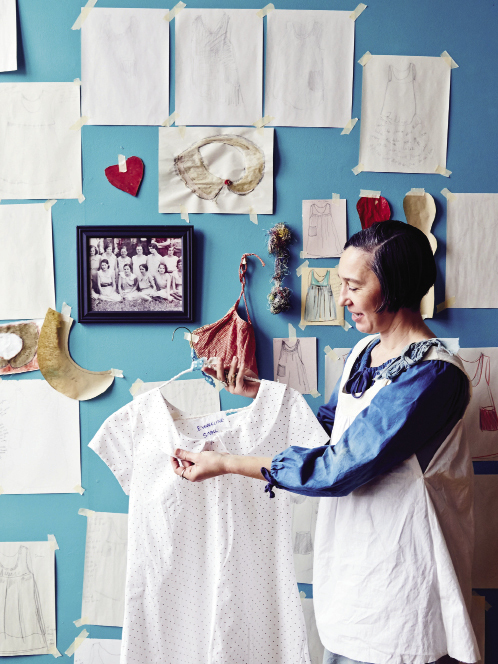 The founder of Magar Hatworks has always been difficult to pin to a specific time or era, sometimes even to a century. 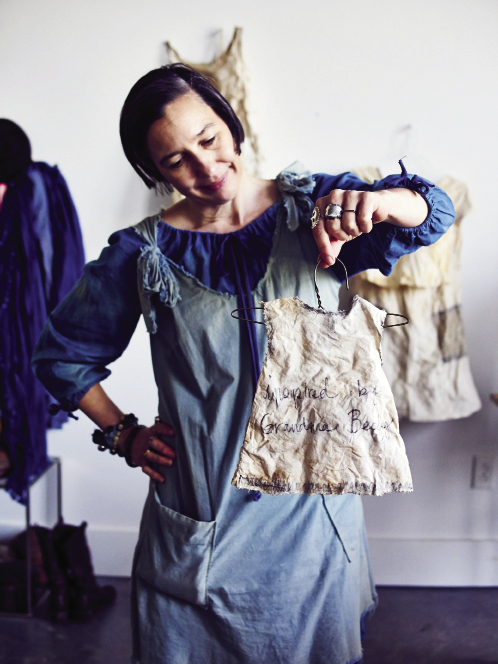 But what’s definite is that she’s always wearing—and crafting—something new and remarkable. 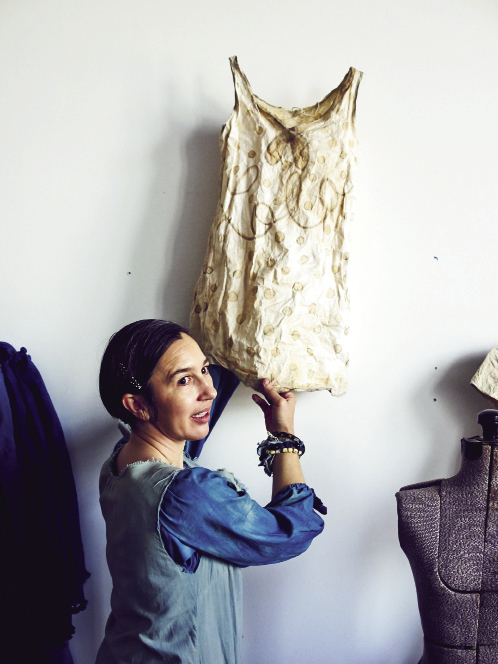 Lately, the artful designer’s focus is frocks. 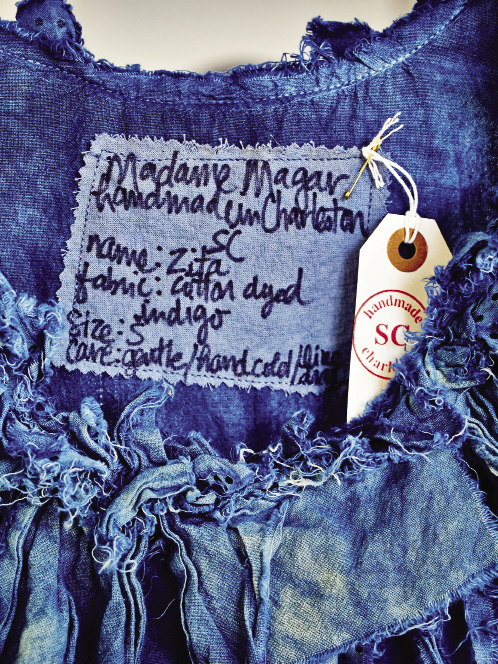 Her Madame Magar line, which launched in 2012, features one-of-a-kind cotton dresses; accessories (including hats); and other sculptural, art-fashion pieces. 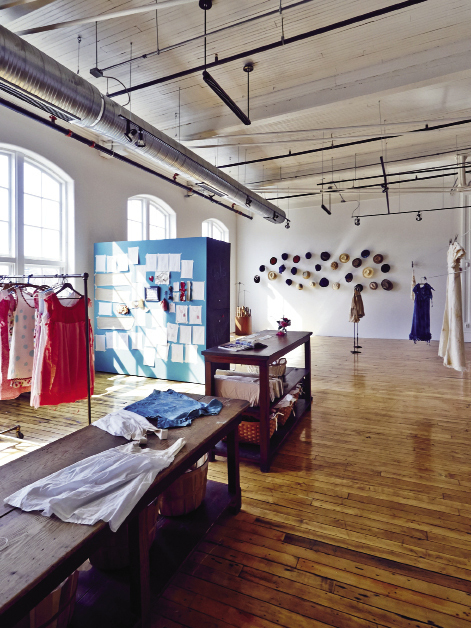 Through early May, her 2014 spring/summer collection—and its slow-fashion process—is debuting in the state capital in a refurbished building of 20th-century textile manufacturer Olympia Mill. 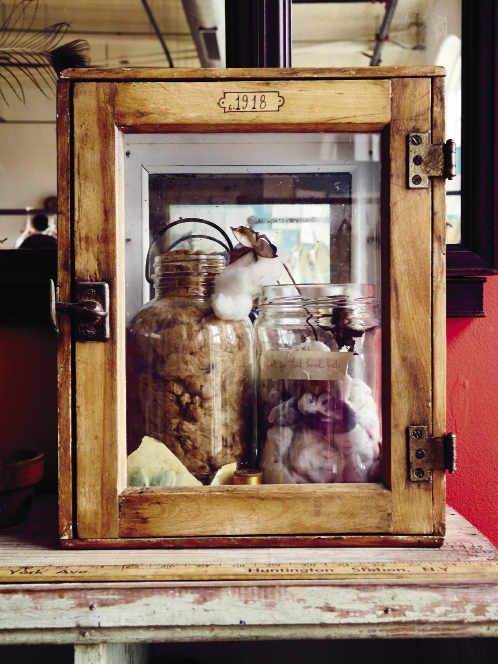 Magar is hatless and padding about barefoot on the wood floors of the airy 2,500-foot space. 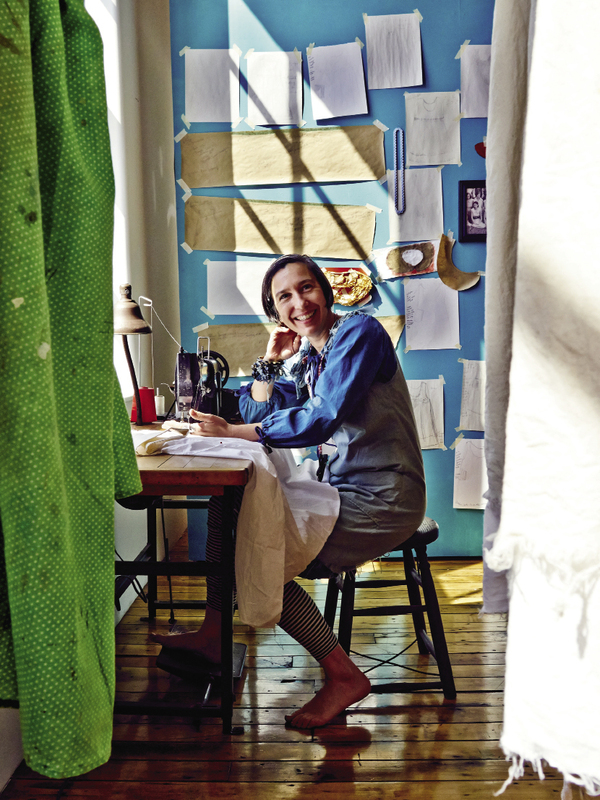 She’s installed her vintage Italian Necchi sewing machine by a window in the working studio, along with a dye station and a “dress shop” that includes a wall of vintage mirrors and several dress stands borrowed from Read Brothers on King Street. 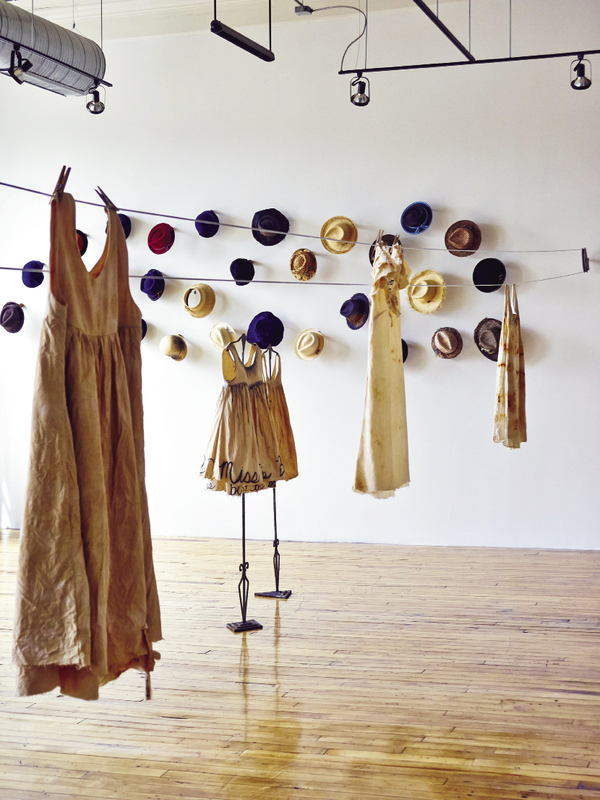 Her hats—for which she’s gained national acclaim—are here, too, hung on her collection of wooden hat forms and suspended on long, wooden spools salvaged from now-closed manufacturers, similar to the Olympia Mill, which was in operation from 1899 to 1996. Until this opportunity at the 701 Center for Contemporary Art, Magar had not been to the brick buildings of the mill on Whaley Street. Yet she felt strong personal connections from her very first visit. 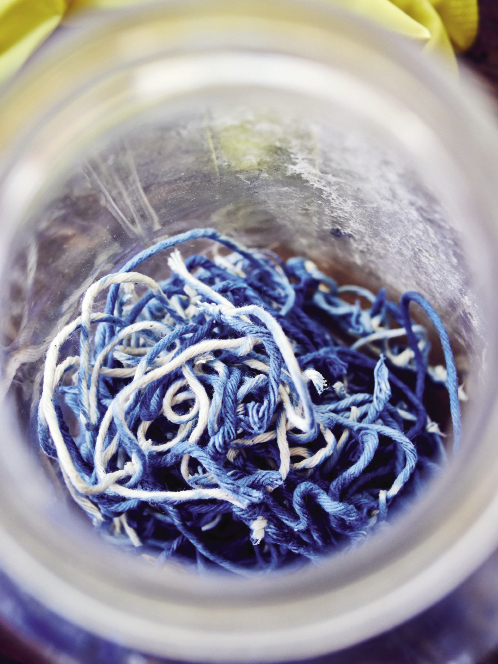 Growing up in Spartanburg, Magar remembers her grandmother and great aunt coming home ticked with lint from working in the cotton textile mills once so commonly found in South Carolina. 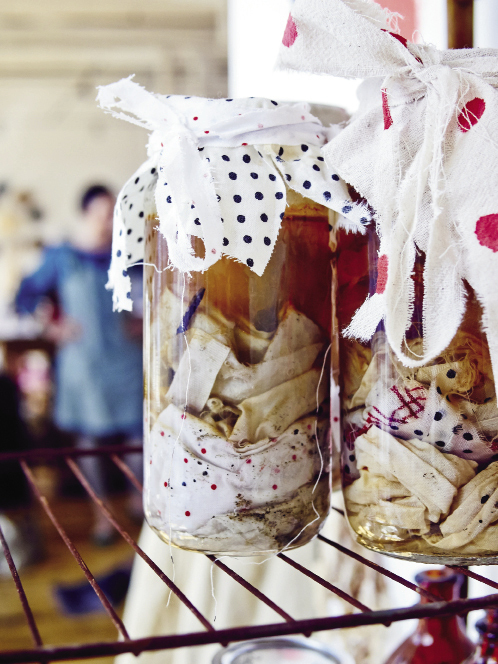 In the environs of the gallery building—originally the mill’s community center—Magar began to explore and absorb some of the millworkers’ experiences. She couldn’t stop looking at an early 20th-century photo of the “Spinning Department,” a group of young women in plain cotton dresses, and her first sketches and dresses in the collection are inspired by those simple designs. Many dresses are named for women pictured in the images or listed in the log of mill workers, including the “Theodosia,” “Lula,” and “Miss Mamie Boozer” (an Olympia Mill Village school principal). Magar also wandered the banks of the nearby Congaree River and gathered its water with its natural orange cast and sparkling mica. The muddy water would become a dye for the muslin of the frocks. When she first began to visit the Whaley Street studio, Magar noticed the sound of trains that frequently chug across this part of downtown Columbia. The mill workers must have heard this too, she realized. 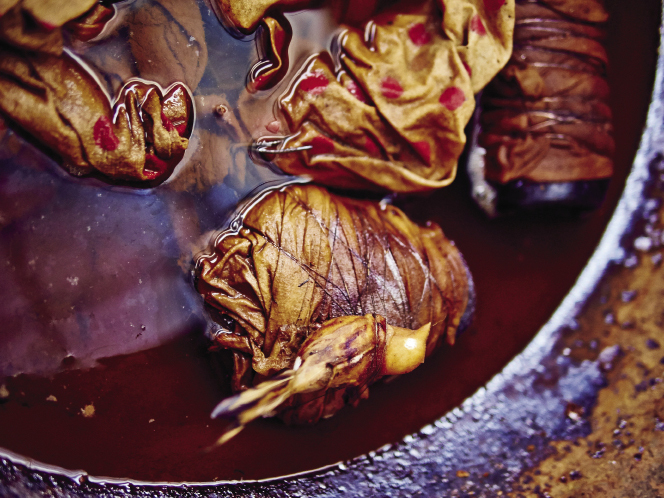 On a visit to the tracks, she found bent and rusted rail spikes and other scrap metal and brought those pieces to her dyeing vat, first winding each tightly in fabric. 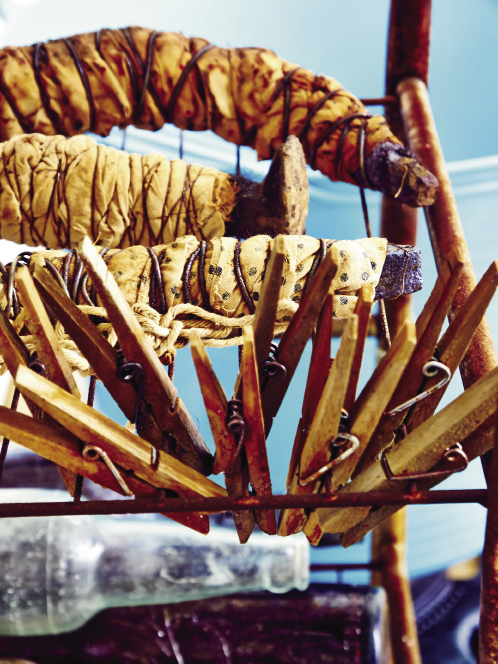 When unwound, the fabric is tracked with lines and color from the rust. All of this is simple and basic, she says, like the mill village life itself. As for the exotic lotus blossoms? I think of those again as I watch Magar at work in the airy gallery that’s strung with dozens of floating frocks. In this space, it’s not difficult to visualize a white profusion rising from the artist to the rafters—except this time it’s not flowers, but rather limitless tufts of fat, billowy cotton. 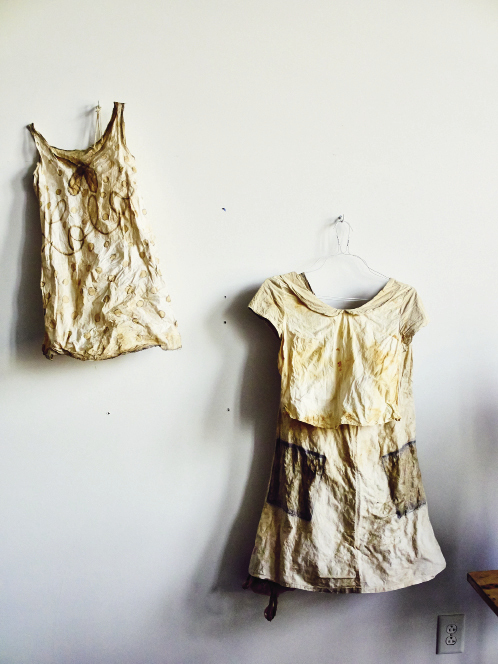 Art installation and collection through May 4. Gallery Hours: Wednesday, 11 a.m.-8 p.m.; Thursday & Friday, 11 a.m.-5 p.m.; Saturday, 9 a.m.-5 p.m.; & Sunday, 1-5 p.m. 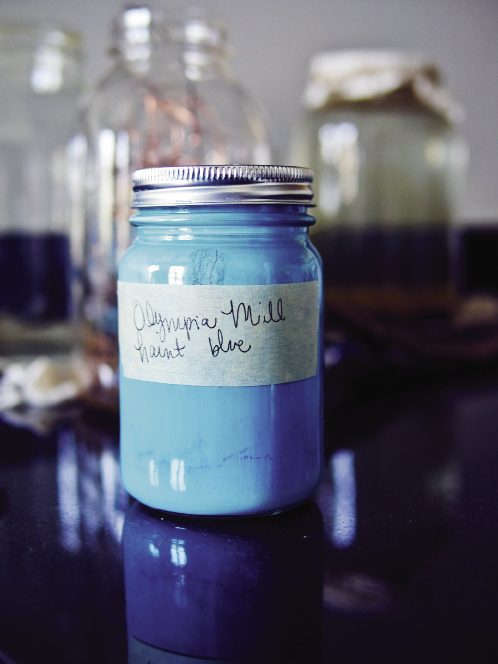 The Mill Collection celebrates the culmination of Madame Magar’s creative workshop installation with a fashion performance and finale party.